My November Ipsy bag finally arrived! This one took forever because of the postal service strike. I'm glad it finally made it in the end! I had added a couple goodies to my bag this month, so that's why I have seven products instead of five. I am totally loving this deep burgundy nail polish! It's a tad more on the orange side than the red one, but is a beautiful shade nonetheless! I got another mascara (can't ever have enough of those), another face oil (I'm surprisingly starting to love these), this velvet blender sponge (can't wait to try it! ), a gorgeous shade of burgundy lip stain, a neutral matt lipstick and this bright blue loose pigment eye-shadow. I was a bit apprehensive about the shade, but when I swatched it on my hand it's a beautiful shimmer, not this crazy blue shade! Who knew? That's what I love about my Ipsy subscription, I get to try new products that would otherwise not catch my eye. 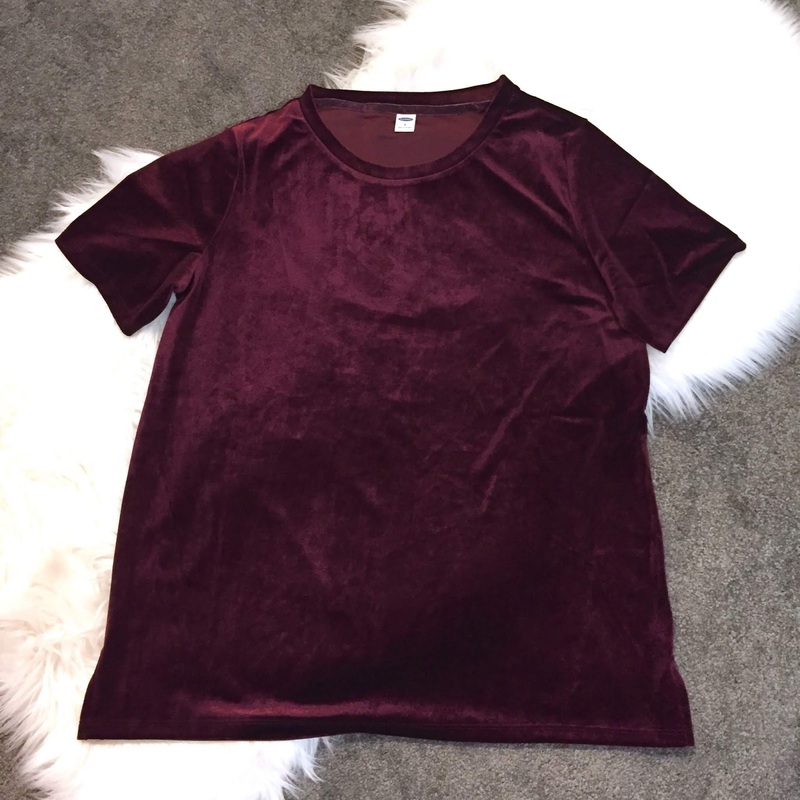 Velvet is totally catching my eye this season, so I naturally had to get a burgundy t-shirt! I like the t-shirt option for velvet because it can easily be dressed up or down. You can casually wear it with jeans and cute earrings for a low-key family affair or pair it with a metallic midi skirt and blazer for a festive night out! Plus, the texture gives you all those cozy feelings so you never feel like you are actually wearing fancy clothes! This is the kind of dressing up I like: effortless! 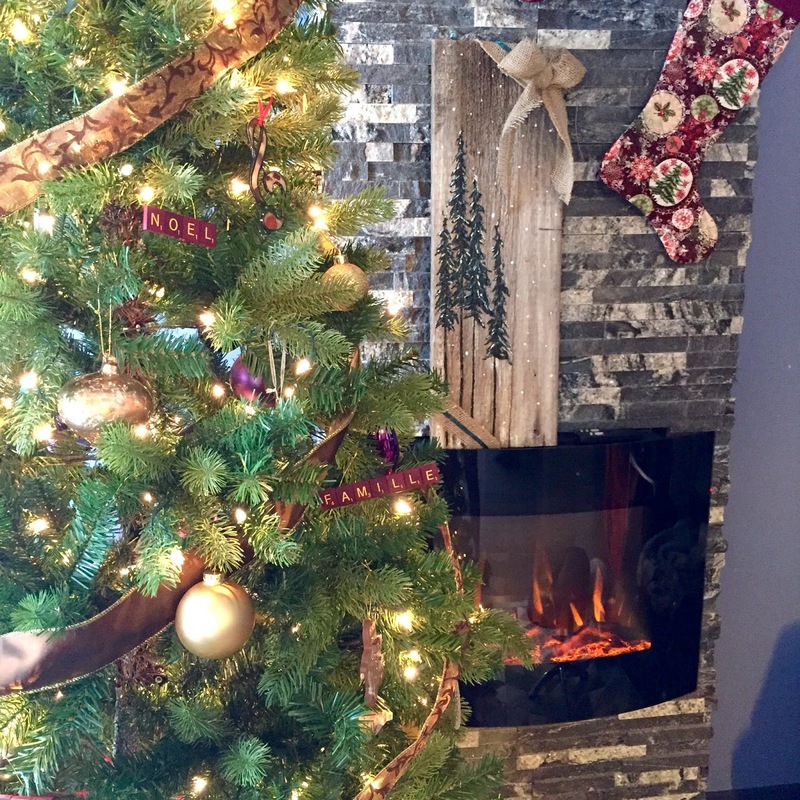 The best time of the year is upon us and it just wouldn't be Christmas without decking the halls! I always look forward to putting up my tree and this year was no different. I started by saying I'd only assemble the tree and fluff the branches one day, and finish trimming it some other time, but once I got started, I just did the whole house! Well, not the entire house, because I limit my decorating to the main room. It's a bit easier to manage that way! I just love going through all the ornaments and the memories attached to them! Some of my favourites are these word ornaments my sister-in-law made me from scrabble tiles! They add such a cute touch to my tree! I've always been a word person, so these are perfect! She also made me a set of fabric ornaments in my tree's colour scheme. Again, some of my favourites! Come to think of it, a big selection of my go-to ornaments are from her! She knows me sooo well, and she's crafty, so it's a winning combination! Every year we add a few new ones that we've collected. This year, we added a gingerbread made out of clay and a treble clef made of puddingstone (or Jasper Conglomorate), which is unique to the area I'm from! Next to the tree, on the mantle, I put up the artwork my sister made us last year and the embroidered stockings my mom gave us ages ago. Decorating the house makes it all nice and cozy and fills me with warm festive cheer! I love when my mom comes to town because she always shows up with treats! 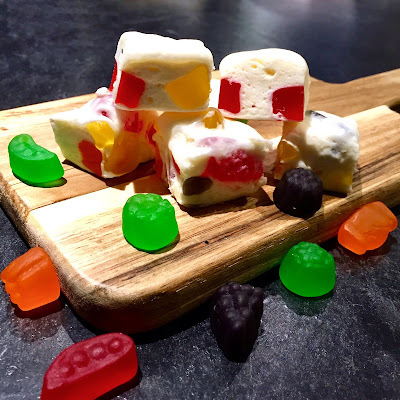 This time, she brought me her famous sour jujube nougat! OMG, this stuff is to die for! I remember face timing my parents last Christmas and they had a bunch of people over, so propped the phone up in the middle of the dinner table so I could see everyone. The downside to that was that I had to watch everybody stuffing their faces in my mom's Christmas treats and raving about this nougat. No treats for me thought, but I have to admit this was the best holiday diet trick! Luckily, I eventually got to try the legendary fudge for myself and it sure lived up to the hype! This time around, my mom switched out the jujubes for sour jujubes and it is a million times better! This is one festive treat I can eat all day long. 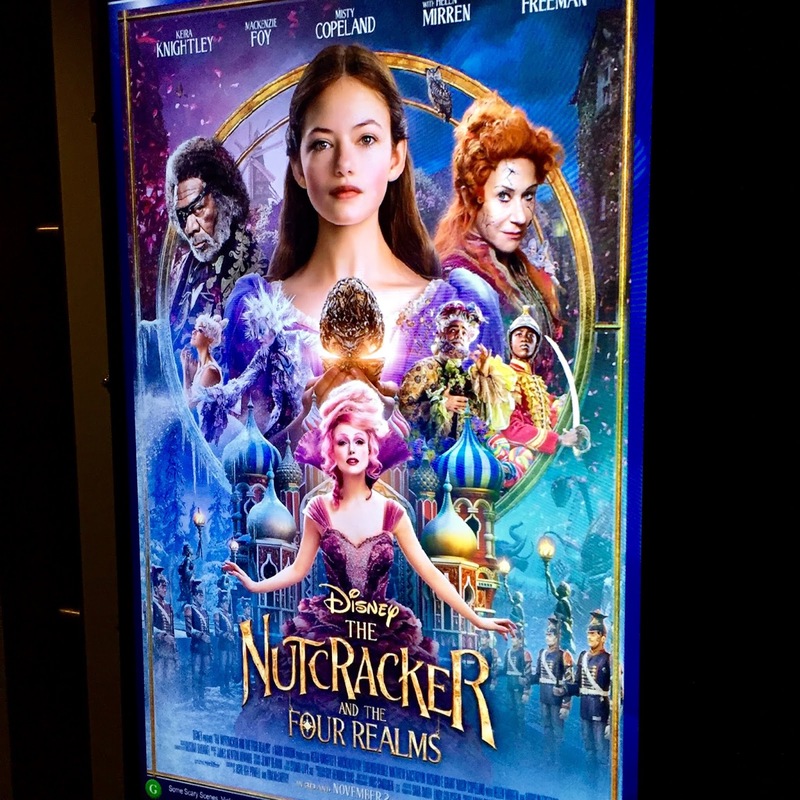 I went to the movies with a friend the other day and we saw The Nutcracker and the Four Realms. Being a huge Nutcracker fan, and having seen the ballet a few times, I was looking forward to this new Disney rendition. I have to say though, I was left a bit underwhelmed. The nod to the ballet with Misty Copeland was amazing and the costumes were great, but I didn't love the plot. To me, it came across as a funny mash-up of Alice in Wonderland and the second movie of the Santa Clause series with a bit of Christmas sprinkled in the mix. I feel like the movie was hyped up a bit too much and relied on its cast of big names for a hit. Unfortunately, the movie fell flat for me, even though the actors' performances were good. I'll stick with the tried and true ballet from now on!